Dr. Kariuki is a Chief Research Officer at the Kenya Medical Research Institute/Centre for Global Health Research (KEMRI/CGHR) and the Malaria Branch Chief in the KEMRI, CDC and LSTM Collaborative Program in Kisumu, Kenya. He graduated with PhD in Immunology from Kenyatta University, Nairobi, Kenya in 2003. 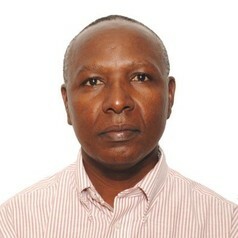 Dr. Kariuki has more than 25 years of research experience focusing on understanding the mechanisms of acquired immunity to malaria in young children and pregnant women, mechanisms of Plasmodium falciparum resistance to antimalarial drugs, clinical trials of existing and potential tools for malaria control, health sytems research and laboratory management. Over the years, he has developed strong scientific, leadership and management skills through development of research protocols, implementation of research projects, mentoring and supervision of graduate students and staff, dissemination of research findings. As the chief of the KEMRI and CDC Malaria Branch, Dr. Kariuki oversee and provide scientific leadership and administrative support to more than 100 staff working in more than 20 projects that encompass diverse areas of malaria research including; basic laboratory research, clinical trials, epidemiology, health systems, entomology, surveillance, monitoring and evaluation and capacity strengthening. He has authored/co-authored more than 85 publications in peer-reviewed journals and supervised more than 15 graduate students. He sits in several technical working groups of the Kenyan Ministry of Health national malaria control program.